Extra Super Tanker unveils some superb new dishes! I have often wondered about the inspiration behind this name “Extra Super Tanker” for a Chinese restaurant? I mean, the place doesn’t really look like a tanker and possibly the description “extra super” refers to the food served here? Well, if that’s the case, then I agree wholeheartedly! Ahhh… but coming back to the “tanker” part, I was told the amusing anecdote behind this. Apparently it was meant to be “tankard” as the previous owner was a beer lover but somehow the spelling went a bit off in the process of registering the business name! Hence “Extra Super Tanker” was born. Ever since the restaurant started in the quiet neighbourhood of Damansara Kim nine years ago, it has been delighting diners with its wholesome, unpretentious honest-to-goodness Chinese cuisine. Chef Chin or better known as “Ah Wah-kor” has helmed the kitchen since the restaurant opened and he has never lost the drive, love and passion in serving up his delicious offerings. His signature evergreen dishes (more on these in an upcoming post) continue to be ever popular with the dining crowd but recently Chef Chin unveiled several new items, which we are pretty sure, will gain popular following. Starting with the 4-Treasure Soup (RM25 per individual bowl), nothing could be more heart-warming than this bowl of milky nutritious broth. 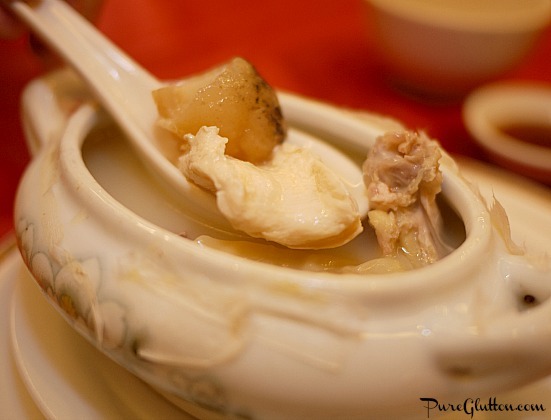 Actually there are more than 4 treasures in it – there are sea cucumber, seafood wantan, dried scallops, fish maw and chicken which have gone into this double-boiled soup. I couldn’t stop slurping the hot delicious soup – its umami sweetness was all natural and addictive. The Gold & Silver Abalone (RM38) is an interesting interplay between abalone and dried scallop which the good chef created with a hint of mischief. What initially looked like 2 abalones on the plate was actually one abalone and a thick slice of hairy gourd stuffed in the centre with a cut-out piece of abalone and a dried scallop stuffed into the centre of the abalone! Very clever indeed. 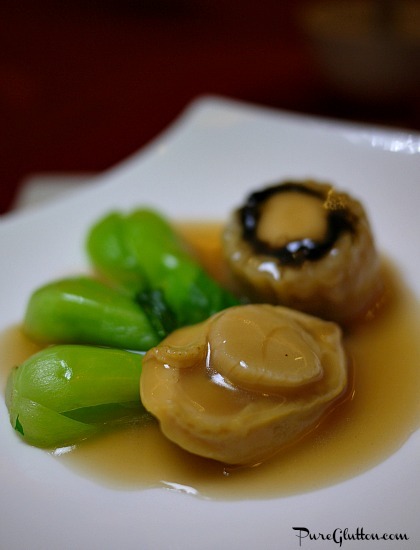 The abalone and gourd are served with a good drenching of thick braising sauce with some blanched bok choy by the side… a great starter dish by any standard! The best way to savour any fresh fish is to cook it by the simplest method. 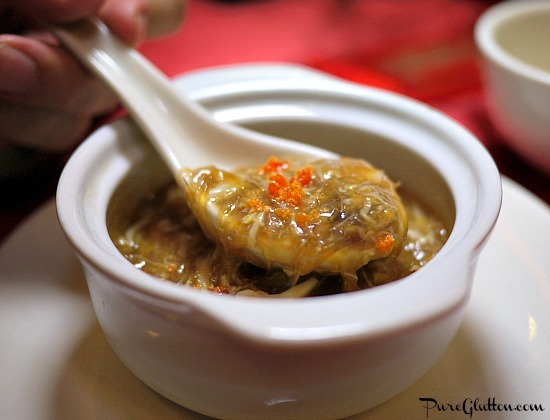 To this end, Chef Chin showed his culinary prowess in the 2-Style Loong Fu Parn (a hybrid of giant garoup and tiger garoupa). 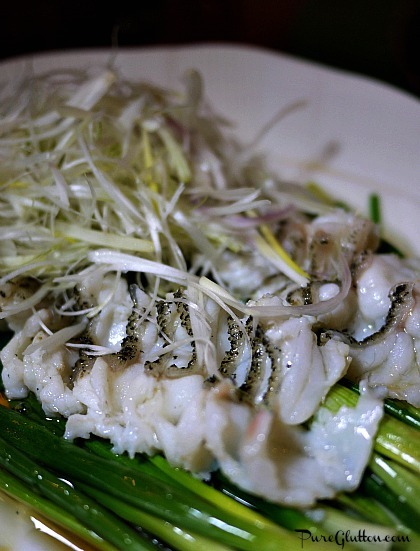 Thin fillets of the fish sat on a bed of spring onions and to this, Chef Chin poured hot oil over the fish pieces till they are just cooked and the aroma of the spring onions was released onto the fish. Prior to serving, all this simple delicious dish needed was just a dash of superior soya sauce. 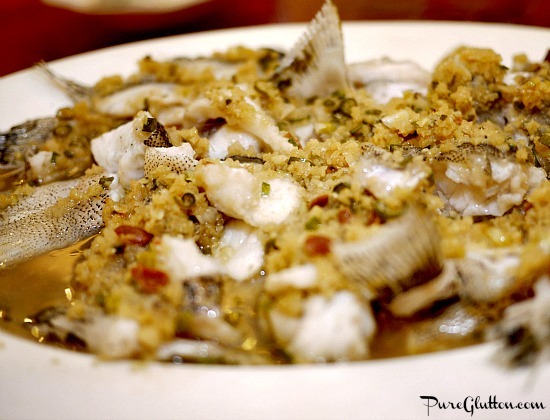 It’s one of the best fish dishes I’ve eaten in a while – plain simple unadulterated fish goodness. You know how the Chinese never waste anything when it comes to food and what more this premium Loong Fu Parn fish! The rest of the fish: tail, head, fins, sides and all are then steamed in salted soya and chopped ginger – every piece was sucked clean, not a sliver of the sweet smooth fish was wasted! 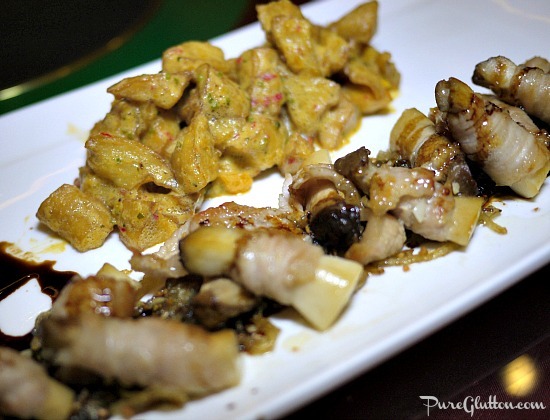 The 2-Style Eringgi Mushrooms (RM25) is another hit. The thick stems of the mushrooms are wrapped in thin slices of pork shoulder and pan-fried while the rounded heads of the mushrooms are done Salted Eggyolks-style. The pork shoulder, with the fat and lean layers are perfect shrouds for the chewy succulent eringgi matched nicely with the bed of caramelised onions. Likewise, we love the salted eggyolk-coated eringgi heads and they disappear very quickly. The most visually impressive and stunning-looking dish must surely be the Golden Japanese Pumpkin holding Braised Pork Ribs (RM40) inside. 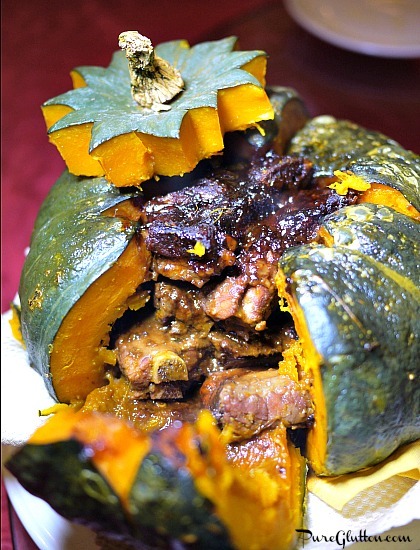 The pork ribs have first been braised with yellow wine mash and then placed inside the pumpkin and double-boiled. When the pumpkin was cut open, the thick aromatic gravy from the braised pork ribs oozed out but most of it had been absorbed into the thick golden flesh of the pumpkin. The texture of the sweet pumpkin is smooth and dewy and when eaten with the tender pork ribs, it was sublime. We wiped off this dish, pumpkin skin and all. Even before the pot of Braised Pork Knuckle & Stomach (RM50) was placed on our table, the strong aroma of Chinese herbs, not unlike the Bak Kut Teh type – with strong top notes of “dong quai”, floated into our nostrils. 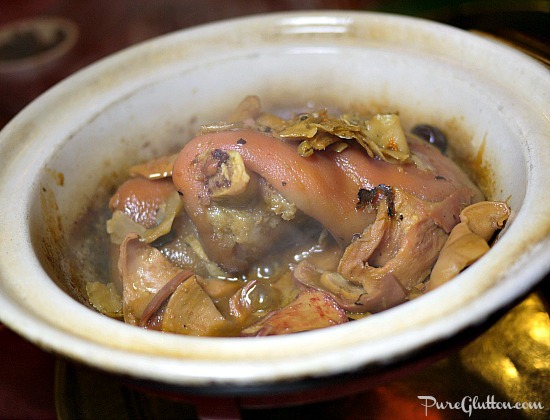 Steaming hot, the pork knuckle and stomach were braised to just the right level of tenderness, neither too sickeningly-mushy nor too chewy hard. The claypot was emptied in record time. Seeing how we were such porcine lovers, Vincent Lam (co-owner of the restaurant) ordered another porky dish for us. This time it was Pork Neck with Tien Chatt vegetables. 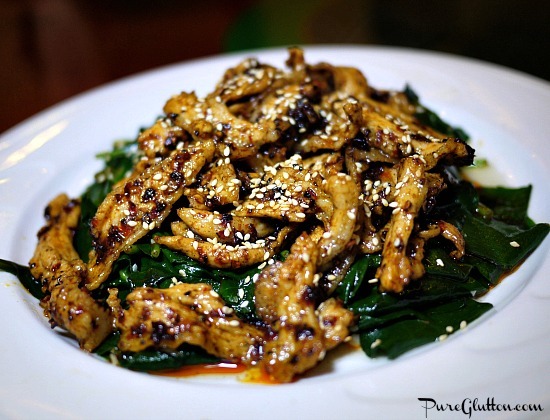 The dark green leafy vegetable with a gelatinous sheen were stir fried with thin slivers of pork neck in a spicy sauce and peppered with sesame seeds. Priced at RM25/35/50 for S/M/L portions, this dish is uniquely scrumptious. Chef Chin is a wizard with braised dishes and a master of fried rice. You must try his Emperor Chien Loong Fried Rice – which I will be blogging about in an upcoming post – but then, all his fried rice dishes are just as good. His new Pumpkin Fried Brown Rice (RM25) is not only healthy, it’s really very tasty as well. 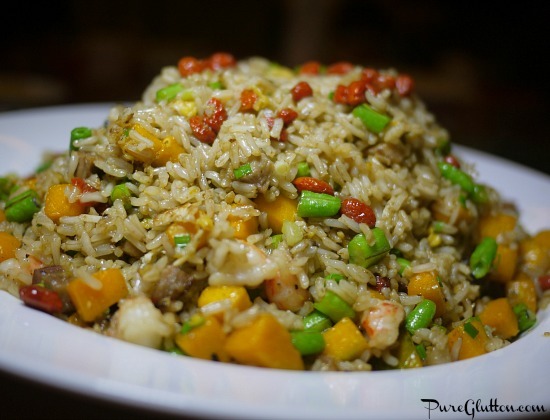 Visually pleasing, the fried rice has cubes of golden pumpkin, shrimps, long beans, eggs and shiny red wolf berries. We love the slight chewiness of the nutty brown rice with all the delicious ingredients fuelling the flavour. The restaurant is extremely popular so please call in advance to order if you are dining here. Chef Chin would hate to disappoint you as many of his specialities need careful and meticulous preparation in advance. We have alway loved the food at Super Tanker and this new menu looks very delicious! The ew dishes are worth checking out! I’m so jealous de. The fried rice looks divine!! !